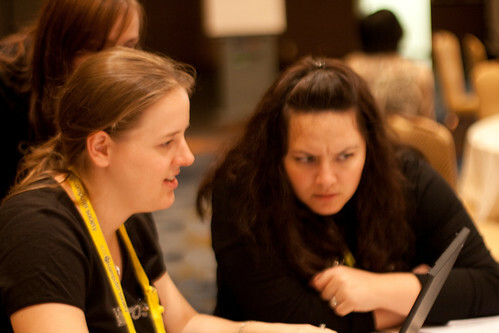 So building on some success last year, we had a codeathon at the Grace Hopper Celebration of Women in Computing. This year, we were working on Sahana Eden, a free and open source disaster management system. I'm going to admit that the start was a litle rough. Even the mentors found the trainings a bit overwhelming and found that a lot of little issues cropped up when you were setting up your dev environment. One of my "favourites" was an issue where you'd have to run something twice in Eclipse before it would work. There were some perplexed faces! It certainly took some work, and some people even came back after the keynotes to keep hacking until late in the night. Fueled with some wine, though, it was pretty fun and I think there was even a patch going in when I stopped by around 11pm. Thanks to everyone who came out and gave it a shot! The open source track was graciously sponsored by the NSA, and we'd love to have it again next year, so if you have any comments about how much you enjoyed it, please let us know! You can post here, or Stormy Peters is collecting all the comments together and you can contact her at stormy at gnome.org. And if you've got suggestions on how we could make the codeathon run more smoothly or things we should do again, we'd love to hear those too! It was very challenging, from getting mentors trained to getting development environments set up through to figuring out what needs doing and how to do it, and I'm sure there are things we can improve upon for next year. I'm very happy to not have to use Eclipse on my own time. I actually like eclipse ok once it's set up, but the learning curve on setup and just sort of general workflow is ridiculously long for casual users. We actually couldn't use it at the university for that reason, which was very frustrating because the debugger is quite reasonable and it irked me constantly that our first year students didn't have easy access to a nice java debugger. Yes, the debugger is probably Eclipse's best feature, but I'm the sort of programmer who looks hard at the source and maybe adds a printf, not the sort who leans on a debugger, so that selling point misses me. My boss is a debugger user and wants us all to think like him. Still, since my little brother is one of the IBM programmers who created it, I have to humour the thing a bit. I was also there in Eclipse's embryonic phase and might actually have known your brother, as I was a co-op student at OTI at the time. Since then, and after a largely failed attempt in 2008 to use it to leverage IBM UIMA properly (too clunky, over-engineered for throwaway research development), I have never really bothered with it. Oh, that's not true, a stint at IBM Research in 2008 meant I was forced to use it. Emacs and print statements for me, especially since I might use multiple minority languages in a given project and, at least until recently, most of them weren't well supported in the Eclipse IDE. Sorry IBM/OTI, can we still be friends? Even though you migrated Lotus Notes and that IM tool to an Eclipse base? Yay! Looks like so much fun! I'm so glad you all did this!!! me too! It was a lot of work and plenty of confusion, but really neat to see it coming together!